SMALL HARD SURFACE CLEANING KIT I – CLEANS UP TO 125 SQ. FT. The Small Hard Surface Cleaning System I is intended for the removal of dog, or cat, or human urine odors ONLY in hard surfaces such as concrete, etc. If cleaning porous surfaces, first use the Prove-It Kit. The Small Hard Surface Cleaning System I is intended for the removal of dog, or cat, or human urine odors in hard surfaces such as concrete, tile, etc. 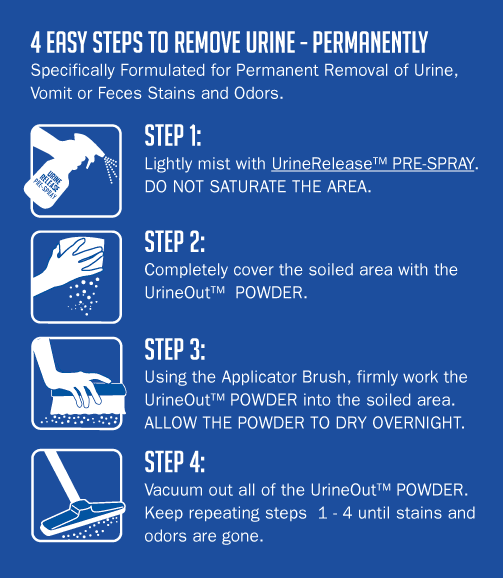 Removed Old Dry Dog, or Cat, or Human Urine Odors from Hard Surfaces, up to 125 sq. ft. If cleaning porous surfaces, first use the Prove-It Kit. Spot cleaning of light odors ONLY. If cleaning porous surfaces, first use the Prove-It Kit.